You would probably identify with those users who spend a considerable part of their days browsing through different websites, portals and social platforms. You know the symptoms - constantly staring at your smartphone and feeling addicted. So addicted that you cannot stop checking what is happening online so that you do not miss something really important and exciting. Now imagine the feeling of having your own website. You will devote all your time to constantly develop and improve it while facing numerous challenges. You will find new friends, followers, get feedback, support and satisfaction for being brave enough to express your point of view. Here comes the question: what name should I choose for my website? The answer: something catchy and easy to remember. So check all possible options and do not get desperate if your very first idea of a website name has already been registered by someone else. We suggest that you try with the domain extension .site. The good news is that this is a relatively new 4-letter alternative and the probability for the desired name to be free is quite considerable. 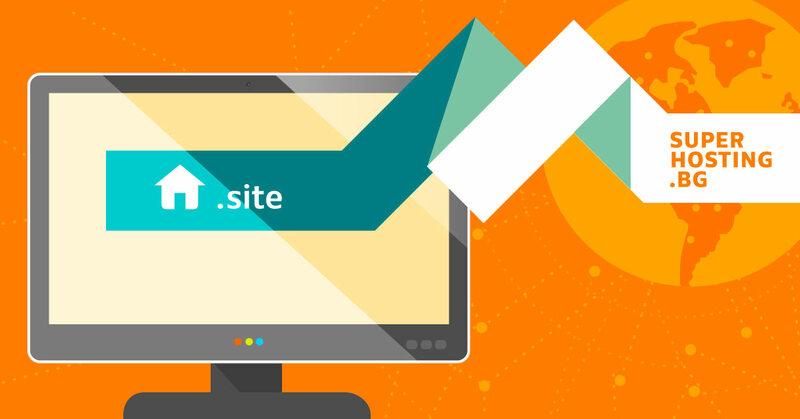 What are the advantages of the .site domain? It is suitable for all types of business activities. It is a great start for your digital presence. It is short and easy to remember. It provides better chance to register the desired website name. It also allows you to present an upcoming advertising campaign. The price is affordable and the registration can be easily performed. This domain extension is very popular amongst global brands and providers of online projects. In what cases you can register the .site domain? Nothing declares your presence more seriously than digital ownership. So provide it with an attractive name which cannot be easily mistaken. You can also benefit from the .site domain’s advantages when you would like to present your portfolio or CV in an original way. Tell the world about yourself but do it with style. Important! You can now grab the .site domain at a promotional Christmas price of BGN 2.75 per year and open the path towards your website’s success.